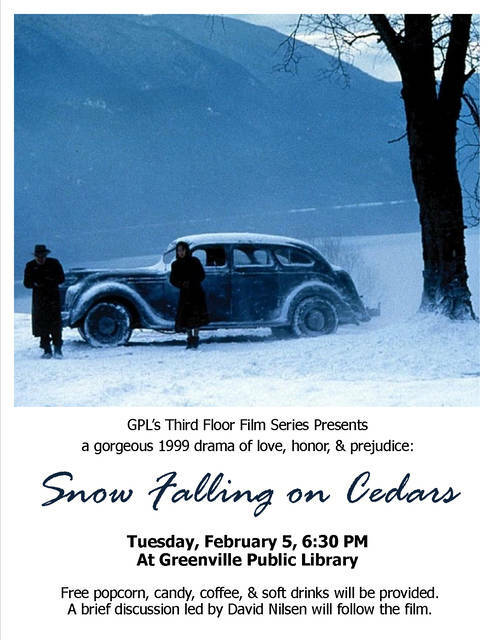 GREENVILLE – The Greenville Public Library’s Third Floor Film Series will screen the 1999 film “Snow Falling on Cedars” in February. Directed by Scott Hicks and based on the titular 1994 novel by David Guterson (available for check-out at Greenville Public Library), “Snow Falling on Cedars” takes a powerful look at love and honor in the face of prejudice. Set shortly after World War II in an isolated fishing town in the Pacific Northwest, the film centers around a murder trial in which a Japanese-American fisherman is suspected of murdering a business rival. Long-dormant racial tensions simmer to the surface as the town faces its own biases and personal loyalties. In the midst of this, one young man who was once in love with the suspect’s wife must weigh his own commitment to justice against his lingering romantic wishes. Featuring gorgeous and ethereal cinematography by Robert Richardson and profound performances by a cast that includes Ethan Hawke, James Cromwell, Sam Shepard, Max Von Sydow, Youki Kudoh and Rick Yune, “Snow Falling on Cedars” is emotionally fraught but ultimately uplifting. The Greenville Public Library will screen the movie at 6:30 p.m. Feb. 5 at the library. Free popcorn, candy and soft drinks will be provided, and David Nilsen will lead a brief discussion after the film.